Welcome to the the land of untrue, unimportant, and outdated advice. 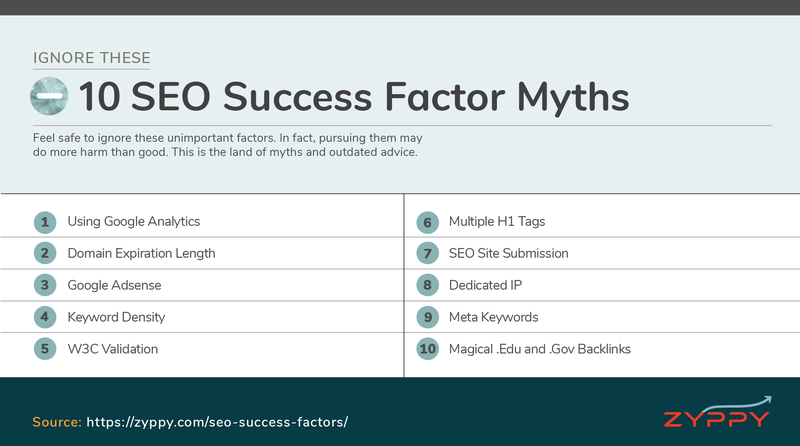 Feel safe to ignore these unimportant success factors. In fact, a few on this list may do more harm than good. A persistent myth some folks believe is that using Google Analytics can help your site to rank. Or conversely, that engagement metrics from your Google Analytics account can influence your search rankings. In fact, neither is true. While it is important to use some type of analytics tracking on your site, you could easily use Piwik, Adobe Analytics, or any other good analytics solution. Google has consistently said they don’t use data from Google Analytics for ranking purposes, and in truth, they have many other places to get the data they need. An older Google Patent suggests that registering your domain for a longer period could be helpful in distinguishing spam site from legitimate sites. The logic behind that patent is that spam sites are rarely registered for more than a year at a time. While Domain Expiration Length could legitimately be a ranking factor, in reality, any effect is very small. Moz’s 2015 Ranking Factors noted a correlation of .04 between expiration length and rankings, which isn’t considered significant. Furthermore, Google has discouraged site owners from worrying about it. That said, if you plan on keeping your domain for a while, it’s a very good idea to extend your registration. Accidentally letting your domain expire is no fun. Among the newly initiated in SEO, there’s a persistent myth that using Google Adsense may help your rankings. It’s not true. Not even a little bit. On the flip side, too many ads—of any kind, Adsense or not—can hurt your rankings. It’s not unusual to see a slight negative correlation between rankings and the amount of ad space. In 2012 Google announced it’s Top Heavy algorithm which demoted sites with too many ads above the fold, along with its Intrusive Interstitial update in 2016. This is a tough one to include in “Not Important” factors because yes, you typically need to use relevant keywords, phrases, and topics in your content to rank. That said, focusing on keyword density—the idea that your content should contain a minimum threshold percentage of exact match keywords—doesn’t typically lead to optimal results. It’s not that keyword usage isn’t important, but rather there are far better ways of optimizing. In fact, recent ranking factor studies have shown either little or no importance whatsoever with keyword density. In fact, most websites have multiple validation errors, even Google itself. What’s much, MUCH more important is if Google and web browsers can properly render the page. If you want to focus on what’s more important, run your URLs through Google’s Fetch and Render tool. And if you want to be concerned about W3C standards, it’s far more helpful to users to focus on accessibility standards. Like W3C validation, SEOs often get obsessed with proper heading structure. One, and only one, H1 heading tag per page is the rule. And it is not to be broken. What’s more important, found through experimentation, is having clear, large text near the beginning of a page that indicates a headline of sorts. Moz discovered this through experimentation, and it holds true today. This was a popular service back in the day to tell different search engines about your website but is worthless today. Certainly, if you have a brand new site, it’s helpful to let Google and other search engines know, but there are far better ways of doing it. Another old SEO myth that was likely propagated by web hosting companies looking to upsell services. This was more a problem when Google found a web server full of spam websites. In this case, any other site on the same server using the same IP might look suspicious. If you are concerned that this is your circumstance (it typically isn’t) the simple solution is to find a more reputable hosting provider. While there were historical advantages to hosting your site with a unique IP in some edge cases, today many hosting companies don’t even offer it as an option. Google doesn’t use the meta keyword tag for ranking purposes. Nope, not even the meta news keyword tag. Let’s be perfectly clear: links from .edu and .gov domains can be fantastic—especially when they are targeted, relevant, and high-authority. For years, SEOs have pursued .edu and .gov backlinks as if they were the Holy Grail. The myth being that .edu and .gov links might automatically carry more weight, or because they are closer to trusted “seed” sites, they may carry more trust authority. Sadly, neither the evidence or the data support these claims. Yes, .edu and .gov links carry value, and you can build an entirely successful backlink strategy on them. But Google has frequently denied that there is anything inherently special about them. The data supports this as well. Correlation studies using data from Moz, Ahrefs, and SearchMetrics all show that while the total number of .edu and .gov backlinks does correlate with higher rankings, it correlates weaker than the total number of all backlinks. Both .edu and .gov links can be bad, as well. In fact, many webmasters report receiving “Unnatural Link” warnings from Google after abusing scholarship link building practices. Put another way: .edu and .gov links can help you to rank, but there’s absolutely nothing special about them. Build ‘em if you can, but no need to fret about it. Feel free to use this infographic with proper attribution. Click here for high-res version. Cyrus is a founder of Zyppy. His mission: to make hard SEO easier for millions of people. He writes about Google SEO, higher rankings, better traffic, improved ROI, marketing, and 10x Content. Find him on Twitter, Facebook, Google+, Moz, and Linkedin.